Bill 178, which put an end to a five-week-old job action by college instructors and mandated binding mediation-arbitration, was approved by Liberals and Progressive Conservatives (opposed by the NDP). The Toronto Sun would later report that “about 27,500 of the roughly 250,000 full-time students decided to withdraw and receive a tuition refund rather than finishing their semester on a condensed timeline.” Other students reportedly would have to work quite hard to survive the first term of their school year once classes resumed. On November 20, 2017, college instructors returned to work. On The Live Drive program (NewsTalk 1290AM CJBK, London, Ontario) with host Andy Oudman, Paul McKeever, leader, Freedom Party of Ontario, was interviewed about the the problem of college strikes that occur during the school year. On The Tom McConnell Show (CJBK-AM 1290 London, and CKTB-AM 610 St. Catharines) Freedom Party President Robert Metz called-in to join the discussion about the taxi industry, and its attempt to promote a monopoly on transportation – a monopoly that ultimately would exclude Uber – by pretending that taxis offer a level of safety not offered by Uber. Metz is particularly critical of taxi monopoly advocate Roger Caranci, with whom he and Freedom Party have had run-ins in the past (among other things, Metz ran against Caranci in the 1999 Ontario provincial general election, in which Caranci was the Liberal candidate in the riding of London North Centre). On 27 January President Donald Trump signed an executive order halting all refugee admissions and temporarily barring people from seven Muslim-majority countries: Syria, Iran, Iraq, Libya, Sudan, Yemen, and Somalia. On January 29, 2017, 6 Muslim men were murdered by gunshot while praying in a Quebec mosque. On January 30, 2017, London Ontario councillor Tanya Parks introduced a motion that asked City staff to (a) work with a city hall diversity committee and come back to council with “the appropriate arrangements” for making London a “sanctuary city”; and (b) have the mayor and staff talk to the federal government about London’s continued commitment to accept refugees from the seven countries under Trump’s temporary ban. The motion received unanimous support from all London councillors, including Councillor Phil Squire who told the media “My concern is, what is a sanctuary city?”. On February 1, 2017, Freedom Party leader Paul McKeever was a guest of The Andrew Lawton show (AM980, London), and he explained that, essentially, a sanctuary city is a city that adopts a policy of harbouring people who are in the country illegally; who lack refugee, immigrant, or citizen status. McKeever explained that, in his view, cities have no lawful authority to make themselves sanctuary cities. Cities that declare themselves to be sanctuary cities are effectively arrogating to themselves refugee and immigration policy-making powers, and undermining federal refugee and immigration policy. The costs and risks to the public are numerous and expensive. 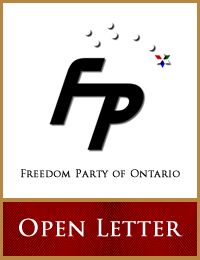 On January 27, 2017, on The Andrew Lawton Show (CFPL AM 980, London, Ontario), Robert Metz, president and CFO of Freedom Party of Ontario, was interviewed by host Andrew Lawton about changes to the way political parties are financed in Ontario, and about proposals to replace Ontario’s first past the post electoral system with a system of proportional representation. After discussing the financing of political parties, Lawton and Metz turned to the issue of electoral reform. Metz explained that although Freedom Party might benefit a bit from a switch from our current “first past the post” system to a system of proportional representation, Freedom Party is against a switch to proportional representation. The Westminster model should be considered “sacred” said Metz. Freedom Party is in favour of principled governance, which is undermined by the minority government that results from proportional representation. On January 18, 2017, Freedom Party leader Paul McKeever was a guest of The Tom McConnell Show (1290 AM CJBK, London, Ontario, and and CKTB-AM 610 St. Catharines, Ontario) and was interviewed about the passage of the new Ontario provincial Bill 2 (the Election Finances Statute Law Amendment Act, 2016). McKeever explained that all present MPPs from all three parties in the Ontario provincial Legislature – including Progressive Conservative leader Patrick Brown and NDP leader Andrea Horwath – voted unanimously in favour of giving their parties a taxpayer funded allowance that, over the next four years, will pay the Liberals, PCs, and NDP the lion’s share of over $47M. McKeever explained that one false pretext for the allowance was that the elimination of corporate and union contributions, and the lowering of the individual contribution limit to $1,200.00, will result in a reduction in funding to the parties, and that the allowance is to make up for the short fall. That pretext is false, because – for the Liberals, PCs, and NDP – the amount of the allowance is far greater than the amounts they were able to earn from total voluntary contributions. McKeever explained that another false pretext for the allowance is that the parties need enough money to pay for the election in a way that will make democracy sufficiently vibrant. That pretext is false, explained McKeever, because the limit on election spending is 80 cents per elector, but the amount of the allowance being paid the Liberals, PCs and NDP is several times the 80 cent limit: they are paying themselves far more than they would need to finance their entire election campaigns on taxpayer funds. McKeever explained that the new legislation essentially puts a $10 price tag on each ballot. McKeever argued that Canadian soldiers have fought and died to maintain democracy in Canada, which includes not having to pay to vote. We’ve already paid for the ballots with the blood of Canadian soldiers and that of Canada’s allies. McKeever explained that, by giving the Liberals, PCs, NDP and Greens an allowance (the Liberals, PCs, and NDP have excluded all other parties – the Greens excepted – from getting an allowance, yet all parties are having their contribution limits lowered anyway…which amounts to a 25% reduction in private, voluntary funding to Freedom Party, based upon 2014 figures), MPPs will have less need to be accountable to the general public. With the government paying them the money they need, MPPs can ignore the demands of their parties’ voluntary contributors. McKeever condemned the allowance as anti-freedom, anti-democratic, and an attempt by the Liberals, PCs, and NDP to ally with one another to prevent competition from other, emerging political parties. He said that Freedom Party is opposed to funding political parties with taxpayer dollars and would work to end the taxpayer funding of all political parties. On January 13, 2017, on The Tom McConnell Show’s ‘Vox Pop’ segment (1290 AM CJBK, London, Ontario, and and CKTB-AM 610 St. Catharines, Ontario), Freedom Party of Ontario supporter Scott Williams-Oakes (a.k.a. “The Brick Wall”) advised McConnell’s listeners about the per-vote subsidy that taxpayers must pay to the Liberal, Progressive Conservative, NDP, and Green Parties (all other political parties receive no subsidy and have had their private contribution limits slashed). 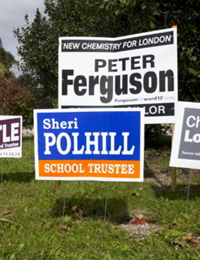 The subsidy, and the limits on contributions to smaller parties, are the result of the passage of Ontario provincial Bill 2 (the Election Finances Statute Law Amendment Act, 2016). On January 12, 2017, on London At Large (1290 AM CJBK, London, Ontario), Robert Metz, president and CFO of Freedom Party of Ontario, was interviewed by host Al Coombs about Ontario provincial Bill 2 (the Election Finances Statute Law Amendment Act, 2016), which simultaneously gives the Liberal, Progressive Conservative, NDP, and Green Parties millions of taxpayer dollars, annually, while imposing a barrier to the private funding of political parties (specifically, lowering the maximum contribution to $1,200 per annum, down from over $9,000.00 per annum).